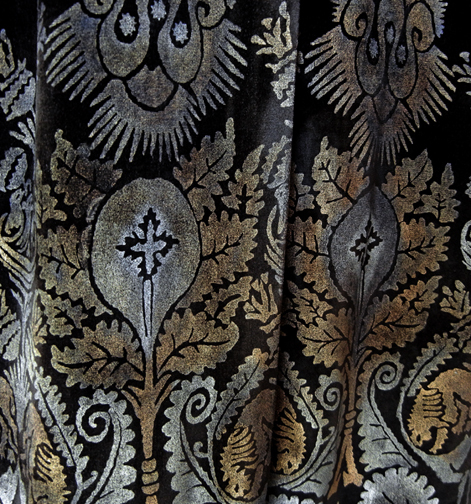 The textile art of Maria Monaci Gallenga is often compared to that of Mariano Fortuny because they both produced hand-stenciled designs that drew inspiration from the distant past. Gallenga became the mentor of the Italian Futurists. 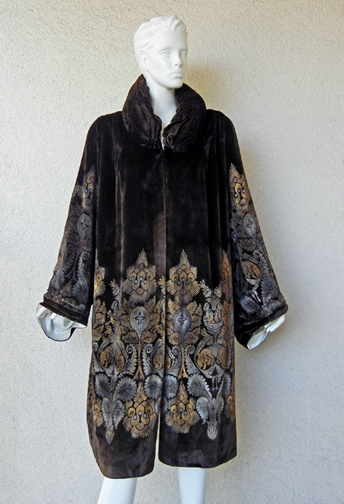 In 1925 she exhibited in the Italian Pavilion at the Art Deco Exposition, winning the Grand Prix for stenciled textiles. 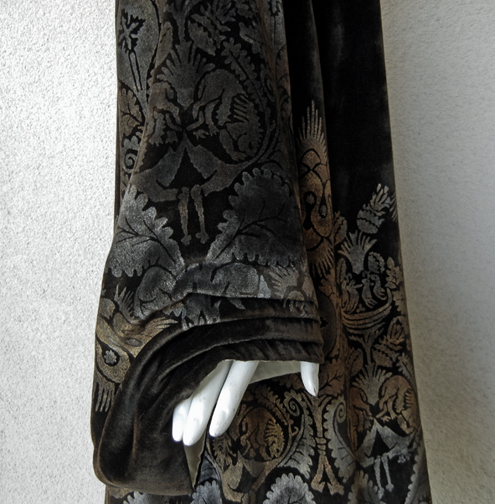 While Fortuny was the noted artist/designer at that time.... Gallenga's achievement was remarkable! 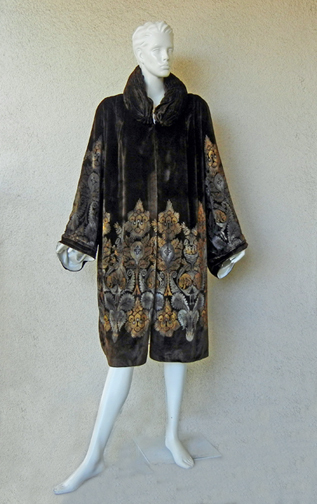 Circa 1920-30's rich chocolate brown silk panne velvet hand painted coat by Maria Monaci Gallenga. Provenance: Gallenga Estate and just acquired recently from Venezia. 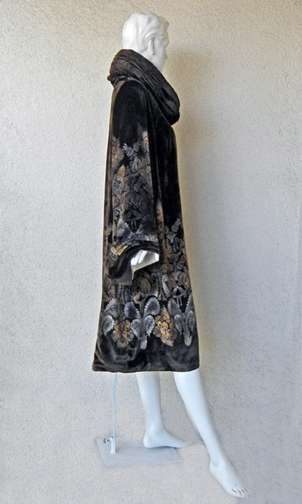 Bust: to approx 50"; length: 49": sleeve: approx 28"; shoulder: 16"
Gallenga's antique effect was done by stencilling on silk velvet; she used up to 9 tones of silver and gold paint to create Gothic inspired patterns, such as birds, goats, tigers, florals etc. 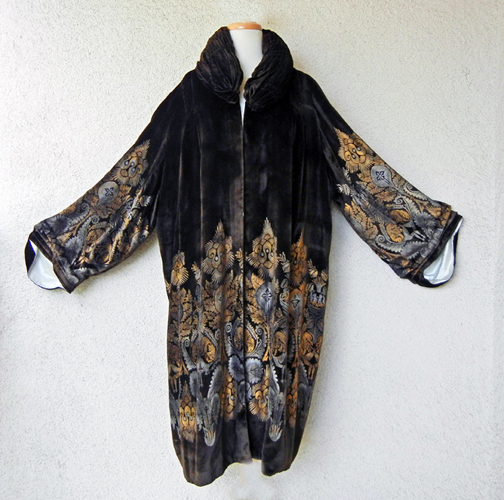 This entire coat is made by hand. 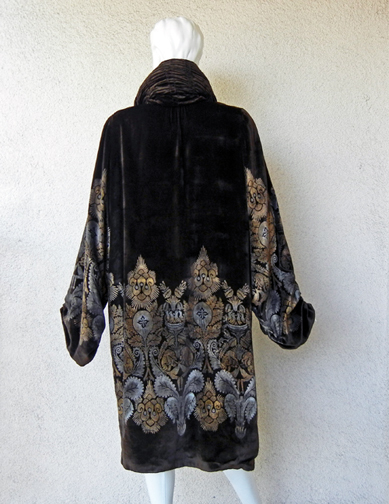 The pattern shows interwining leaves, birds,; the back arranged in a steeple artisan pattern. Slightly oversized with large hand pleated bell shaped sleeves. 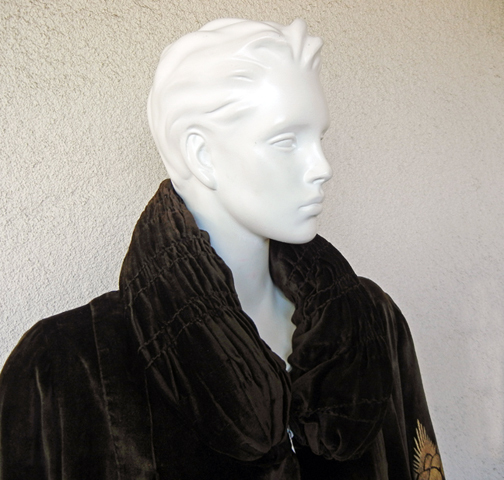 Collar is full and ruched. The brown velvet is rich and soft... not dry and the entire shell is in excellent condition. 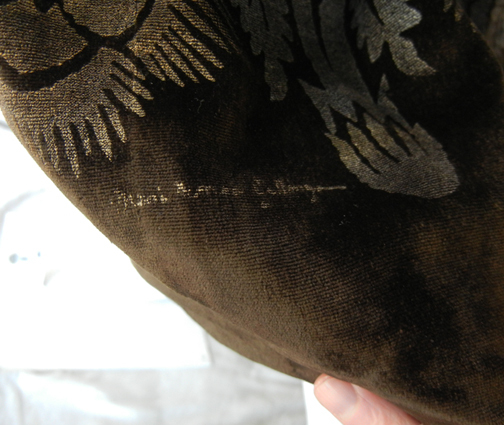 Gallenga's signature on velvet (see photo). Interior lined in creme silk and is in excellent condition. Condition: coat is in excellent condition.